Pasvik Nature Reserve is located in the northwestern part of the Kola Peninsula, on the border of the forest-tundra and northern boreal forest within the boundaries of the northern taiga subzone. The total area of ​​the reserve, organized July 16, 1992, is 14,687 hectares. On the conservation area is dominated by a subarctic climate. 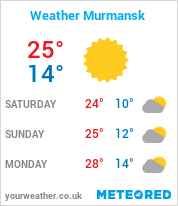 The lowest temperature values ​​are typical for February, when the thermometer drops to an average -11С. The warmest month is July with an average temperature of +12C. Winter thaw often observed in summer frosts. In late September, the first snow falls, and in October, formed a steady snow cover, which lasts for 180-200 days. The frost-free period lasts for 80-90 days. Relief Reserve Pasvik - structural-denudation, which was formed as a result of the destruction of mountain systems. In protected areas to be lake Inari, which area - 1050 km2. A fall in the numerous streams and rivers. The depth of the lake is 60 m, its banks are beautiful and are indented. Inari is rich in fish: pike, perch, trout, young trout, grayling, and whitefish. A large part of the lakes are concentrated in the North of the reserve. This shallow water, peaty, silty or sandy shores. Flora and fauna of the reserve Pasvik. The flora of the reserve Pasvik represented 331 views angiosperms, 2 - gymnosperms, 10 - fern, 19 - Lycopsida plants. Furthermore, here represented lichens (215), and mushrooms (61). Grow in the reserve are the most northern forests in Europe. Birch and pine and pine forests are characteristic of the flat part. The most common on the reserve territory sparse pine forests, of which 40% - indigenous. They are divided into two groups: the lichen pine (belomoshniki) and moss (shrub, herbaceous, sphagnum, dolgomoshniki, green moss). Fauna Reserve Pasvik has 34 species of mammals, 218 - birds, 1 - reptiles, 1 - amphibians, 11 - fish. Among the birds are common glaucous gulls, mergansers, Lutkov, Gogol, Teal, Mallard, Black-throated Diver, gray cranes, golden plover, snipe, dandies, capercaillie, grouse and others. Typical representatives of mammals - elk, brown bear, squirrel, marten, mink, ermine, fox, hare. Much less common deer, wolverine, lynx, fox, wolf. Mailing address: Russia, Murmansk, Pechenga, 184424, p. Rajakoski.